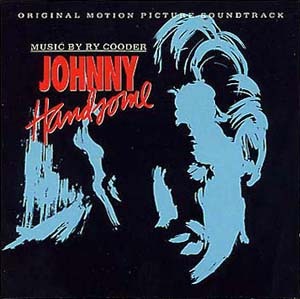 This week’s guitarist-penned score, the 350th Soundtrack of the Week, is Johnny Handsome by Ry Cooder. align="left"> The music is performed by a core trio of Cooder with Jim Keltner on drums and Steve Douglas on sax. There’s also a horn section playing arrangements by Van Dyke Parks. Cooper plays keyboards, bass, accordion, fiddle and percussion in addition to his familiar guitar. Most of the music is lyrical and wistful. When there are grooves of any kind Keltner freakin’ nails it! The only “rock” moments come with “First Week at Work” and “Smells Like Money”. The rest of the cues are either lush, dreamy and textural or “down home” groovin’.